2 dormitorios, 1 baño, terraza con vistas panorámicas. Apartamento para 6 personas situado en el centro del barrio histórico y turístico de Granada (el Albaicin situado enfrente de la Alhambra). Consta de salón, cocina, 2 dormitorios, baño y terraza compartida con otro apartamento. Dispone de aire acondicionado frio/calor en salón y dormitorios. Ropa de cama y toallas incluidas. Todas las habitaciones son exteriores. Ideal para disfrutar de la zona mágica de la ciudad, el centro de la ciudad se haya a 10 minutos a pié. Disponemos de una plaza grande para su coche en un Parking vigilado a 4 minutos a pie de la casa. Disponemos de una plaza grande para su coche en un Parking vigilado a 1 minuto a pie de la casa. El apartamento esta nuevo y en un barrio precioso! Samar’s apartment was in a lovely area perched on a hillside. We were on a little plaza with restaurants and shopping nearby. It was lively but not noisy at night. The apartment was compact but full of amenities to make our stay comfortable, including maps and information regarding nearby restaurants. The views from the rooftop terrace were lovely. This was the perfect place for my 2 college age kids and my husband and I to stay while in Granada after visiting Madrid and Barcelona. It is just as pictured and even better...loved the simple holiday touches they had such as poinsettia, holiday ribbon on the towels, candy in a candy dish etc. It was clean and the sheets and towels even smelled fresh!! Samar answered my e-mail IMMEDIATELY when we had a question about the wifi. GREAT LOCATION AS WELL!! You can walk to everything but be sure to eat at the restaurants overlooking the Alhambra that are basically outside your door!!! 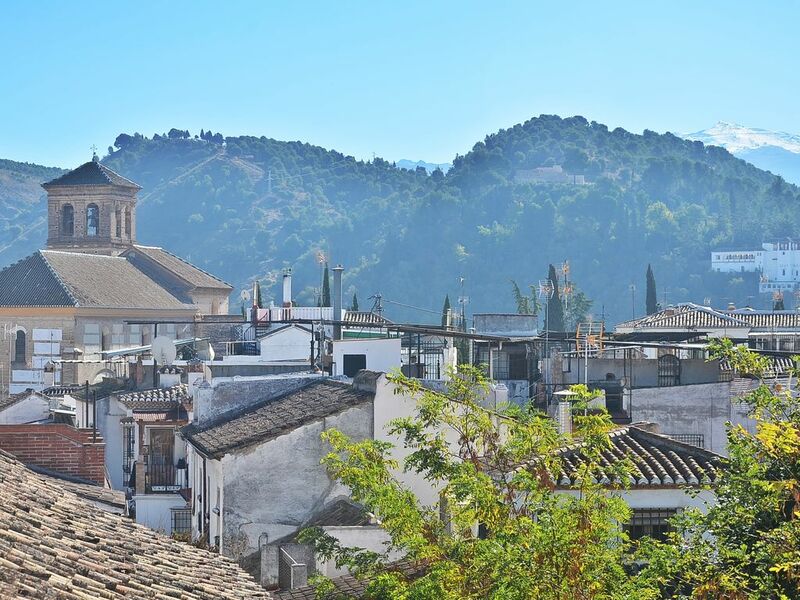 If you like to walk/hike(we do), want the historic Granada experience, this is the place. Las tarifas están sujetas a cambios mientras se confirme la reserva.